I had the honor of speaking at George's funeral service on Sept. 22. The following were my prepared remarks regarding George's work during the 1970s through 2018. So many of friends of George have written beautiful tributes to him this week, and I will shamelessly plagiarize from these tributes and not give anybody credit. Little did we realize when we were all writing these tributes that we were fulfilling one of George’s deepest wishes for us: that we write for Substance, his gritty little newspaper that started out defending the downtrodden substitute teachers (a condition not much changed today). I know Sharon is putting together all this for publication in Substance which she plans to carry on. 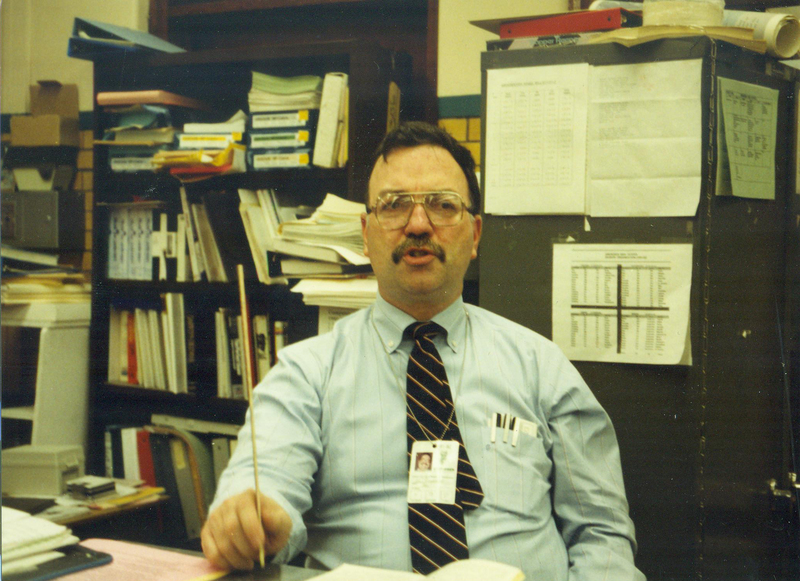 George Schmidt at Amundsen High School, where he taught English from January 1984 until September 1993.George and Substance became the teachers’ first line of defense when they could go nowhere else for justice. He would get many calls asking for his help. His skills at research and analysis were genius. He could read and retain with an encyclopedic knowledge in many areas. His knowledge of the law, the union contract, the workings of the grievance procedure, and the tricks of parliamentary procedure were astounding. He would explain any of this to any teachers and other personnel who asked. He helped so many of us in so many ways, personal as well as professional, that many have described him as their mentor and talk today about how indebted they’ll always be to him. He saved the careers of many, though ultimately he lost his own. His fight-back made him dangerous to the administration of the Chicago Public Schools, and he was shuffled from one school to another throughout his career. As one Chicago Teachers Union staff member described it to me, many teachers who fight abuses at a school back down when their principal tells them, “Something bad can happen to you if you persist in your resistance.” And they go, “Okay, okay, I’ll go along.” But George would say, “No, something bad could happen to you.’' George and Sharon demonstrated this fight-back spirit recently on her job at Steinmetz High School when the principal there tried to censor the newspaper Sharon sponsored by cutting a survey article with student and community opinions about the district-dictated new school schedule. Sharon fought back on-line and in Substance, George publishing some deep background on the principal who backed off pronto. At first I thought, “Why are George and Sharon risking her job like this?” But, hey, they won! So, when in the ‘90s, the multitude of high-stakes tests were making money for many (including the Bush son who wasn’t political), when the tests were threatening schools and teachers, were torturing students and taking time away from real learning, George published every one the CASE exams and showed the public how there were no correct answers to many items and how incompetent the tests were. So the CASE was cancelled, but then-CPS CEO Paul Vallas used that one-dollar court victory (one dollar was George’s fine, whereas he had been sued for a million dollars), used it to destroy George’s career and rob thousands of students of the opportunity to be taught by a life-changing teacher. George loved that one teacher called him after CASE was published to say that George had balls of stone. 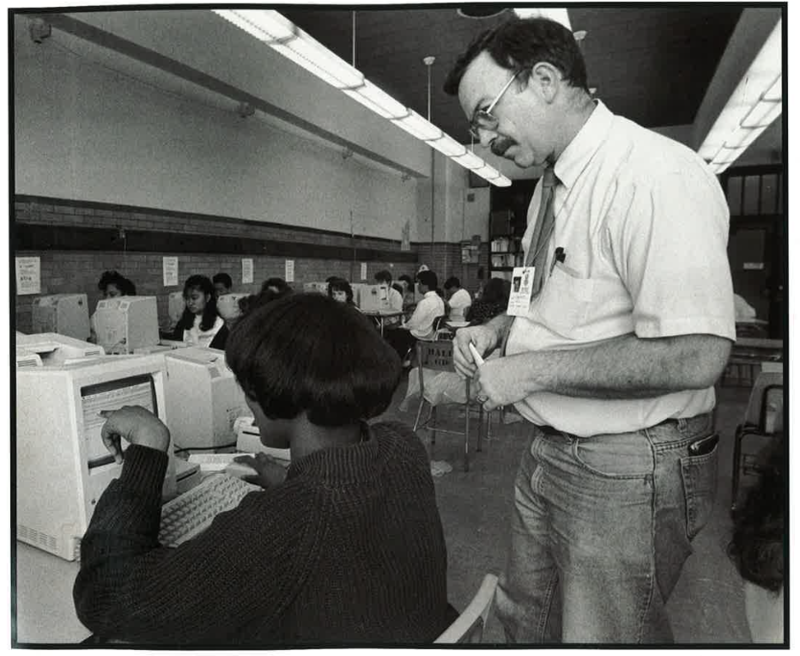 George Schmidt teaches his Amundsen students using Macintosh computers in the late 1980s. The photo and a story about George appeared in the Macintosh Writing Resource Guide, K-12. The 56-page book was published by Apple Computer, Inc. in 1990.At every school, he had remarkable achievements, either as a union delegate stopping abusive and educationally misguided principals. Or insisting that the union do its job of defending teachers. Or as a teacher, for example, creating the first Apple computer classroom at Amundsen High School with a showcase demonstration held at IIT. Or the revamp he did of the disciplinary system at Bowen High School where the gang problem could not raise its ugly head then, at least inside the school, because the discipline team he and the community created successfully got the students into their classrooms, no longer able to roam the halls. Outside of the school, mornings and after school, he and the principal would walk the perimeter of the school, so students started to feel safe entering and leaving school. I visited him there one day to get his help on the SIPPA, the nonsensical School Improvement Plan I was tasked with producing, and I saw not a single student in the halls between classes—an amazing feat for any school. But this is the teacher Paul Vallas and the members of the Chicago Board of Education did high-fives upon firing—high fives in front of all us who had come to defend George. I wanted to be comprehensive about George in this speech, but I realized after reading many tributes that there is always more to say when it comes to George. Among his achievements ranks high his study of the Board budget where he was able to challenge the announced budget deficits that mid-year were no longer deficits. One progressive alderman got him (along with the late great Leo Gorenstein) to do summer work on a budget commission to produce a report for the School Finance Authority who, of course, ignored the findings. George has left his mark on journalism in general and Chicago journalism and media in particular. The media learned from George that there were plenty of news and scandals to be found in following the Substance leads on the Board. George publicized the Board of Education monthly meetings, speaking at them about the mismanagement and the corruption in CPS, as well as publishing articles. And the media followed. George was our social justice warrior in so many battles. We marveled at his superhuman energy as he pulled us along in his wake. He rang an early bell of warning about how the powerful had their eye on stealing our teacher pensions as has happened in many corporations where people who had contributed to their pensions all their working lives found the pension money gone—and this all done legally. George also rang the bell about the plan to destroy public education as we know it so that privatized charter schools could profit at our students’ and taxpayers’ expense. In this vein, early on, he exposed the so-called miracle educator Marva Collins who pretended that in her private school, minority students were reading and reciting Shakespeare, whereas the public schools were failing. George exposed the fraud when he showed that only the one or two students who could do this were paraded as examples of what all the students could do. He also showed that while Marva called herself a non-profit, she was anything but, being supported by the establishment in whose interest it was to destroy public education. As a fighter of racism, he early on also wrote a booklet about how the deliberate segregation in Chicago produced unequal education, bell curves showing showing the difference between the scores of Black and White students. He was a bully boy and fought in Marquette Park against those who attacked the march of Dr. King. His analyses of recent times extended to today’s reality where great numbers of veteran African American teachers have lost their careers; where Black neighborhoods are being destroyed not by benign neglect but by deliberate design—by the lack of jobs, housing, medical care, mental health services, and even food security. Regarding the military, George had been young conscientious objector to the Vietnam War and was assigned, ironically enough, the community work of teaching for a few months in inner city schools (which is what he wanted to do anyway). During the war, he worked with soldiers and their organizations to end that war. He wrote about this work and against the war extensively. However—no contradiction—he had always been proud of his parents’ service in World War II, an entirely different war, and wrote extensively about that as well. Many, many late Substance nights produced many stories of Board and Union scandals, but the longest publication besides the CASE pages was the James Moffat scandal. George was the first person the social worker came to and the first person to believe her when she said that students were coming to her about Moffat, the principal of Kelvyn Park High School, who was sexually abusing boys and girls in his office, among them some of the most vulnerable in the school. George published the complete transcripts of the trial. Moffat was convicted and jailed. George also worked in electoral politics having come to a strong belief in democracy. To that end, he worked to reform the Chicago Teachers Union by being an articulate delegate in the House of Delegates, and variously being a consultant for the Debbie Lynch and Karen Lewis union administrations, as well as mustering opposition slates three times to run in union elections to unseat administrations that to his mind did not adequately serve the dues-paying membership. When he got in trouble with his own caucus for being critical of mistakes made, the membership beginning with maybe ten strong African American women and Michael Brunson, CTU recording secretary, came to his defense. They would have had to come through them to kick him out. I was so proud of such friends who rose to defend such a controversial and complex union and caucus member. Sharon said she was bringing all the religion here, but that I could represent the secular beliefs of George and his “Lefty” progressive and battling side. He was raised a Catholic, as was I, and it’s been said that being raised Catholic and being a Lefty go well together, both types being deep in dogma and guilt. He had wanted to be a Jesuit priest before his convictions turned elsewise. I had wanted to be a nun. We both may have found relief in the progressive causes for which we campaigned. I’ll end by paraphrasing an inscription on a World War II monument in Europe: “Take off your caps. Here rests the flower of union teachers who know how to fight.” Go, George. In 1984 a student approached me stating that she had been molested by her principal. Eventually I learned that she was one of many female and male victims. I tried to report this matter to higher-ups at the Board and was rebuffed. It was only with the aid and support of George that the perpetrator was finally held to account. Without George I would not have had access to a lawyer and to union leaders who were willing to take the matter seriously. I will always appreciate his help. Wonderful words Terry. The prose short, sweet and impacting. You too were quite a team! My favorite piece of wit and wisdom from George is when he told me he could write a standardized test for kids on the State Street Corridor that they would ace and that kids from Schaumburg would bomb. I absolutely believed him -- not just the point, but that he himself was literally capable of creating that test. An unsung Chicago hero. Thanks, Sharon, for the wonderful photos you attached to all the tributes to George here. Thanks, Jim Vail, for the compliment. Thanks to everyone who so honored George here.